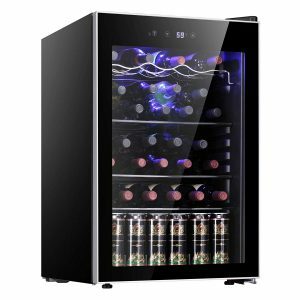 Black JAMFLY JC128UEX is a 37-bottle capacity compact countertop style, freestanding design thermoelectric wine fridge cooler with a quiet and vibration-less operation. You have three options to choose from, 17-bottle, 26-bottle and 37-bottle coolers with the same design and materials and different prices you may want to check out on Amazon.com. These three are single zone thermoelectric wine coolers with a single thermostat/temperature adjustment in Fahrenheit via the display panel. The temperature can be adjusted between 40 and 61 degrees Fahrenheit. Please note that 55 degrees Fahrenheit is commonly considered to be the optimal temperature for wine storage. As long as you don’t open the cooler door frequently, the interior temp will stay consistently at what you set it to. JamFly Thermoelectric Wine Cooler has an attractive modern design- is easy on the eyes, weighs 68.3 pounds and measures 20.5 x 21.3 x 31.4 inches. You can put your white and red bottles on the shelves, and the 37-bottle capacity is for standards sized Bordeaux type bottles. Canned beer or other drinks can also be stored at the bottom section. The black metal shelves are easily removable to make up space for larger or different shaped bottles. It has a double pane glass door that offers UV protection. 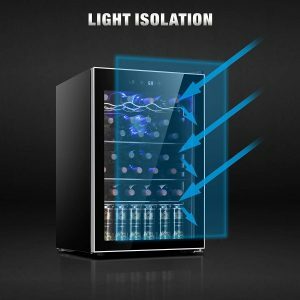 And you’ll find a blue/purple headlamp at the top that will illuminate the whole cooler interior and will not heat up your bottles. It shows off your wine collection nicely and you can pick the wine bottle before opening the door and not overwork the compressor. The bad ultraviolet lights will be blocked out by the double pane tempered glass door with air-tight seal. And there will be temperature consistency and humidity balance, creating an ideal environment for your wine bottles. Thermoelectric costs less than wine cellars or fridge and are less costly to maintain. This modern and energy-efficient thermoelectric cooler offers stable performance consistently, runs very quietly without any noise or vibrations. With as little vibrations as possible, the natural sediments won’t be disturbed and your wine will age gracefully. The efficient thermoelectric system uses up little power, also protecting the environment (CFC-free polyurethane foam insulation). Storing your wine in an environment with consistent and optimal temperature and humidity ensures the quality is protected with all the flavors maintained. Overall you’re getting quite decent value for the dollar with this thermoelectric wine cooler.